Nimbrethil, an Alpine doe, takes a break from carrying gear on a multi-day pack trip in the Oregon Cascades. 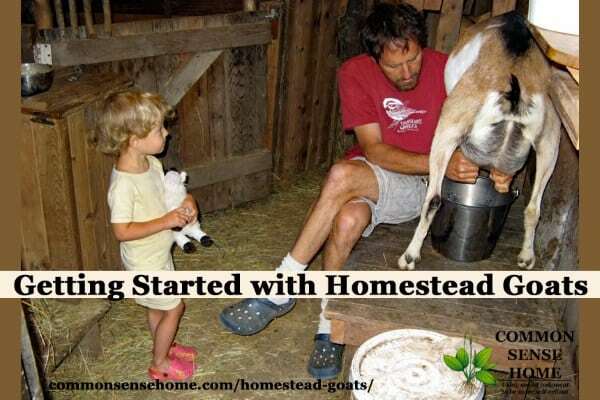 Raising your own homestead goats as dairy animals is a great way to get connected to your food source. Goats are not only a fabulous source of high quality milk, but are an incredibly versatile animal on a homestead. 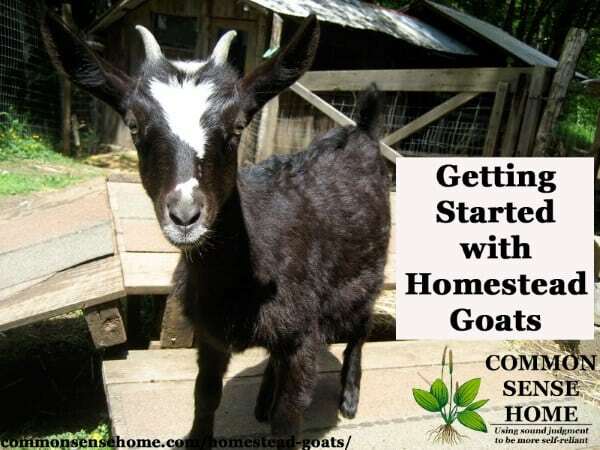 Homestead goats can also provide meat, fiber, carry a pack, clear brush, or serve as a livestock companion. Dairy goats have endearing personalities, which make them a joy to keep on virtually any size homestead. What Breed of Homestead Goats Should I Choose? 1. How much milk will you need, and what will you do with it? Are you interested in making cheese or butter, or do you just need enough milk for fresh consumption? 2. How much space do you have available? If you have plenty of acreage, perhaps a larger breed of homestead goats, like a Saanen, would be a good choice. If you are raising goats in your backyard, you might consider a small breed, like a Nigerian Dwarf. 3. Your personal preference. Perhaps you love the floppy ears of a Nubian, or the colorful markings of an Alpine. Since you will be spending lots of time caring for, and milking your dairy goat, be sure to choose a goat that you will enjoy being with. 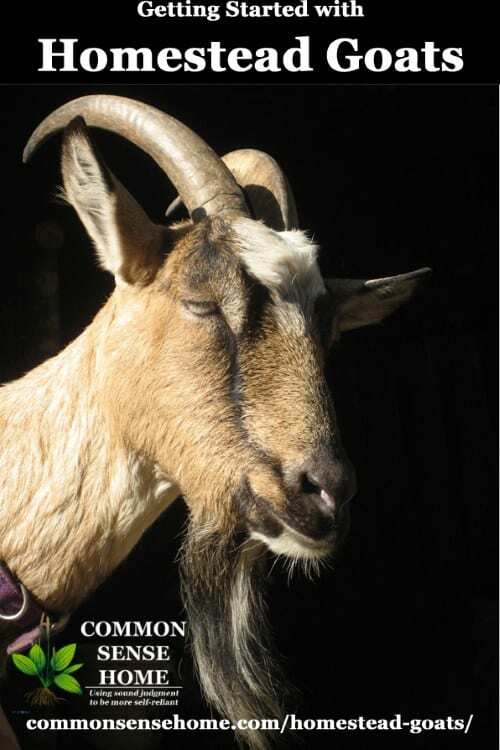 See Storey's Illustrated Breed Guide to Sheep, Goats, Cattle and Pigs: 163 Breeds from Common to Rare for a more detailed discussion of goat breeds. Rose, a mature Alpine dairy goat, basks in the sun. Alpines are a medium- to large-sized breed that originated in the Alps of France and Switzerland, so they tend to do well in cold climates. Alpines are known for giving good quantities of milk, but the percentage of protein and butterfat are not as high as other breeds. They come in a wide range of colors and markings. Our family has primarily raised purebred Alpines, and we love the flavor and quality of their milk for drinking and for cheese making. Nubians are one of the most popular breeds in the United States. Their milk is very high in butterfat, with a creamy flavor. With their floppy ears and Roman noses, Nubians are a distinctive looking breed. They tend to be very friendly and gregarious, as well as quite vocal! They are a good choice for families with young children. The Nigerian Dwarf breed has only recently been recognized as a dairy breed, but has rapidly gained popularity among backyard farmers. Despite their small size (around 18-20 inches! ), Nigerian Dwarves can produce up to 1-2 quarts of milk per day of very tasty, high protein, and high butterfat milk. They are a great choice for homesteaders without a lot of acreage, or those wanting to keep goats in an urban environment. La Mancha goats can be distinguished from other breeds by the virtual absence of external ears. La Manchas are hardy animals, and high yield milkers, with high protein and butterfat content. Saanens are an all-white to cream colored goat, and tend to be quite large. They have calm and cooperative dispositions, and with enough space, are considered to be easy to manage, despite their large size. While Saanens are known for their high milk production, their milk is lower in butterfat. Milking Nimbrethil on a hand built stanchion. Basic Goat Care – What Do You Need to Raise Goats? Where will your milking parlor be located? Does your feeding manger have an open floor plan, so goats are not trapped in corners? Do you have a kidding area, or a space where you can separate an injured or sick goat? Does the barn have electricity or access to running water? Situating a barn close to your house may make cold winters or kidding season much easier to manage. Good fencing keeps wily goats in and predators out. Fencing must be strong and tall. Goats are very inquisitive, and known to test gates and fences! Popular options for goat fencing include woven-wire and electric fencing. Access to fresh water at all times is extremely important for dairy goats, particularly in hot weather, and when does are in milk. Watering systems need not be elaborate – a simple 5-gallon bucket will suffice – but they must be kept clean and full. If you live in a cold climate, consider how you will keep goats’ water from freezing in winter. Automatic watering systems are available, and can be a great option for homesteaders that work off-site. Goats are browsing animals, not grazers like cow and sheep. Rather, a goat’s natural predilection is to sample a diverse range of plants, shrubs, and trees. Offering your goats access to browse will maximize their health and wellness. However, because few homesteads have adequate acreage to provide their goats with year-round browse, hay is often given as a dietary staple. Good quality, grass-based hay should be kept dry and free of mold. When does are in milk, they are often given alfalfa which typically has more protein, vitamins and minerals, or supplemental grain, such as corn, oats, and barley. Salt, and minerals are important supplements for goats, particularly if your local soils are deficient in minerals. We like to give our goats a salt and mineral lick and baking soda on a free-choice basis. An Alpine goat kid cavorts on a pallet playground. A good all-around goat care book: Living with Goats: Everything You Need to Know to Raise Your Own Backyard Herd by Margaret Hathaway. Goats are hands down my favorite homestead animal. Their endearing personalities, versatility on the homestead, and delicious milk (not to mention goat milk ice cream!) make for a winning combination. This is a guest post by Teri Page of Homestead Honey. Teri and her family are building an off-grid homestead from scratch on 10 acres in Northeast Missouri. You can read about their adventures building a tiny house, growing a food forest and organic gardens, and raising two young kids at Homestead Honey. You can also find Homestead Honey on Facebook and Pinterest. Their lovely Etsy shop, Acorn Hill Handcrafts, is inspired by their Missouri homestead. They feature quality, unique handmade items such as cutting boards, coat racks and serving boards. Originally published in 2014, updated in 2016. Thanks, Jan! I appreciate you sharing your experience. I stumbled upon your blog while looking for a good checklist for things I need for my doeling French Alpine that I just adopted. Thank you so much! Very helpful! Although I am very nervous about raising goats on my homestead (I’ve been raising three dogs and they are easy-peasy! ), I’m hoping her transition will be smooth and I will be a good goat mommy! Also, I loved to read that you are building a homestead of your own with your family! I’m going to give the rest of your blog a read and hopefully it will give me inspiration for my own. I am on this new journey of my own coming from the big city to the open range. I love it and I’m glad to see that others are expanding in the same ways! It’s great to build relationships with other people who are on a homestead, either off-grid living or minimally on-grid. Being able to share tips, tricks and other resources with each other is great! Thanks again! You’re welcome, and good luck on your journey. Yes, certain breeds of goat can be used for fiber, such as Cashmere, Angora and the crosses Nigora and Pygora. I’ve never raised goats for fiber, but my understanding is that some are sheared, and others are combed. We have a small goat farm consisting of 30+ Saanen goats in Turkey. Currently, we have a fully closed shelter but it cost too much to built. Now, we need more space and I’m thinking of having a simpler shelter (three-sided open shelter maybe). The area the farm located can be really cold (between -3 to 5 Celcius with snow) in the winter. My question is: How much cold could Saanen breed endure? Do you have any idea? Most goats can actually tolerate quite cold temperatures. What they can’t tolerate is wet. So as long as your goats can stay dry, and get out of the wind, I would think they should be fine, particularly as Saanens are an alpine goat (not one of the African breeds). I have friend who goat-sat a flock of Nubians for several months. He warned me when I stopped by that the ram had butted him a couple of times. One time he flew backward several feet. The ram my friend was herding would ram people standing behind a fence. I’ve heard a few of other people, some of them with family goat herds comment that they have butting Nubians. Glad there are other breeds with tasty milk! Are there training tips for discouraging this tendency among goats in general? 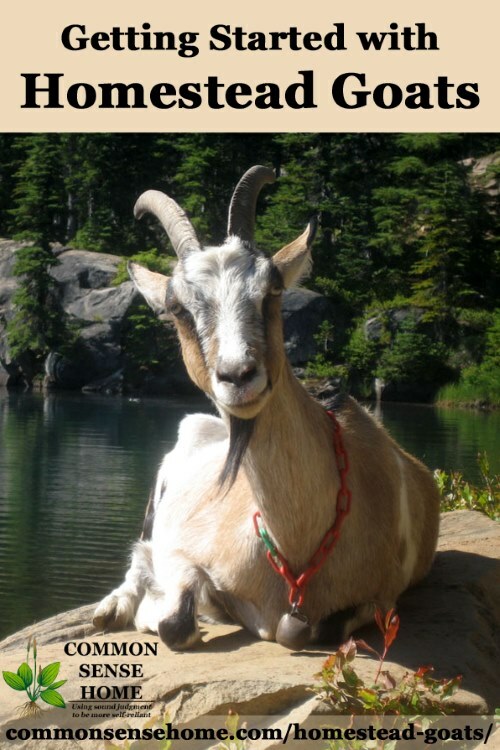 Really wanting to get a goat. Live in mn have 30 acres with chicken. Wanting the goat for grazing buckthorn. I love animals. We also have a rabbit. Papers do not matter to me. I hear 2 are recommended Would a dog kennel suffice with a large fenced area for day time. I know this is probably taboo but I would like to buy a goat primarily for meat. I live in town and have a fairly small back yard so raising a goat is not really an option (besides I know I would get WAY too attached to the little beast and would end up with a lifetime pet, like I really need another one!) What are your reccomendations for a good meat variety, age range and what to be aware of in terms of diseases etc.? I’ve raised ducks, chickens, pigs, rabbits, dogs and cats, but not goats ! Also, I live in Northern Commiefornia. I checked in with a couple of friends of mine who raise goats, and they suggest Boer goats, or pygmies if size is an issue, Nubians for duel purpose. I’m seeing most folks online recommending 6 months to 16 months for butchering, although some process older animals into sausage or ground meat. E coli and Salmonella may be present and potentially passed along if proper sanitation is not used during butchering. The USDA as a full rundown of goat diseases at Zoonotic Diseases of Sheep and Goats.